Pottinger's new Servo 45M plough designed for tractors between 140 and 240hp at the Agritechnica 2017 event in Germany. 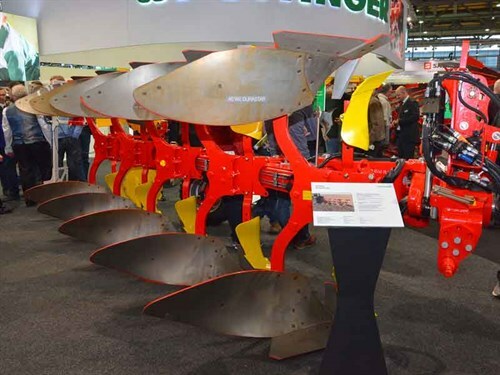 The mounted reversible ploughs will be available in Europe in December as four-furrow and five-furrow models. Available with an inter-body spacing of 95 cm or 102 cm and an under-beam clearance of 80 cm, or 90 cm as an option, the traction control expansion module enables the weight of the Servo 45M to be transferred to the tractor. Check out our full Agritechnica report in our upcoming issue of Farm Trader (#251, on-sale date: 4 December 2017). Check out more machinery releases at Agritechnica 2017.